No matter how much you practice, you can’t defy the laws of physics, but an understanding of basis body physics and body alignment coupled with correct mind-set will greatly help you. F= m x a is Newton’s second law of Force equals mass times acceleration. But, you should know that a punch requires multiple accelerations of different masses working together simultaneously (a.k.a “technique”), and the dynamics of a something like a punch are fairly complex as we are dealing with many levers, forces and torques. So, even though the physics of a punch is not as cut and dry as F = m x a, it covers the basics of what you need to know. 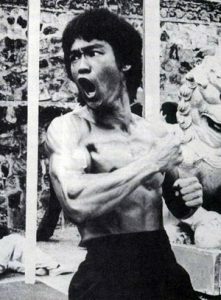 You see, the power of your punch depends mainly on how fast you can accelerate your mass. The quicker you accelerate your mass into the target, the more powerful your punch is. So now, let’s look at those two components. The first thing you want to increase is your mass. More mass equals more potential punching power. You want to increase the amount of mass you can manage to transfer into the target. If you are a beginner in Karate, the only mass you’ll be able to move into the target is basically your hand. If you train a little longer, you might get the whole arm behind the punch. That’s a few more pounds! And if you train even more… you might finally get your whole bodies mass behind the punch. Awesome! When you reach that last stage, you’ll be able to generate legendary amounts of power – even if you’re a tiny person. The idea is to put every percent of your body’s mass into your punch. To do this, you need to combine correct technique with a good understanding of your own body. Then comes the next step; hurling that body mass away. The second step is acceleration. Most people think acceleration is equal to speed, but it’s not. Acceleration is how fast you increase the speed. You need to increase the speed of your mass in as few seconds as possible. It’s not enough to have speed in your technique. You need to actually reach that speed super-fast too – otherwise you won’t get insane power! For this to happen, your muscle fibers need to be sizzling hot and ready to fire in perfect sequence (= good technique) in order to accelerate your mass from a state of relaxation to tension (impact) as quickly as possible. Again, it all comes down to correct technique. This depends greatly on your ability to recruit fast-twitch muscle fibers through your central nervous system. In other words, you cannot be lazy. You need to have the warrior mind-set. In order to achieve the power you want, you need to enter each punch with total focus and unwavering commitment. In Japanese, this mind-set is known as “fudo-shin”, or ‘immovable mind’. Basically, your mentality needs to be strong enough to move mountains. The harder you can push yourself mentally, the harder you can punch physically. Sadly, many people have weak minds. This holds them back from reaching their potential more than any of their physical or technical attributes. You need to align all three components of shin-gi-tai (mind-technique-body) to perform at top level, no matter if you’re punching, kicking or blocking. Then just add a little science to it – and you have a deadly cocktail. No matter how many years you have studied the martial arts, it’s always important to examine and work to perfect your basics. This article is going to do just that. Here, we examine one of the primary moves of martial arts: the basic straight punch. For some of you, this information may be familiar, but for many it will provide new food for thought. We will begin by examining some of the common injuries that occur from improper structural alignment in the basic punch. We will then discuss proper hand, wrist and arm alignment for a punch, and how the force of the punch is absorbed within the body. Finally, we will discuss some elements of maximizing force or power of the punch. It is amazing how many people punch incorrectly. By this we don’t mean using the incorrect type of punch, but instead punching anatomically incorrectly. It should be pretty obvious that the purpose of a punch is to deliver force. And that force is intended to go to your opponent, NOT to yourself. While the above statement seems obvious, apparently it is NOT. In fact a lot of students, even senior ones, punch incorrectly, and they hurt themselves doing it. The most common injury is what is known as “boxer’s fracture,” which is a fracture of the long bone that runs across the top of the hand (metacarpal) and/or the knuckle of the little finger and sometimes the ring finger too. The top of the hand is not well supported for the transmission of force because it connects to other bones of the wrist at an oblique angle. Other common injuries include the fracture of the wrist and/or the elbow. Please don’t think that the boxer’s fracture is one that occurs only in new students or inexperienced fighters. Just the opposite is true. The new and inexperienced person frequently cannot generate sufficient force to cause a boxer’s fracture, whereas with training the ability to deliver force increases and with it the occurrence of boxer’s fractures. The problem is that most people do not pay close enough attention to how they align their hand when they strike. Turning the hand so that the little knuckle (and sometimes that of the ring finger too) strikes first is the most common cause of boxer’s fracture. Another problem is that people do not align their entire wrist correctly when doing the basic front straight punch. If it is bent or bends during contact, injury to the wrist can occur. 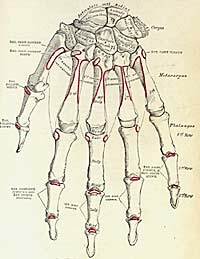 Notice that there is a solid bone-to-bone connection for the transmission of impact force of a punch from the knuckles of the first and index fingers through the long bones (metacarpals) of the hand into the wrist and up the forearm. The little finger’s metacarpal bone, however, lacks this support since it meets the wrist at an oblique angle. Injury to the wrist can occur when the wrist of a punching hand is not straight and buckles during contact. Boxer’s hands are taped into the proper position so that the force is automatically aligned to go down the wrist and into the arm. The fixed wrist prevents creating the large hooking punch (try it sometime) and helps limit the damage. But, since boxers have relied on an artificial means of keeping the wrist aligned, they have not learned how to do so themselves. So out of the ring they can easily damage their hands because they are not properly aligned. Another problem is the new development of soft punching bags. There are several martial arts companies that put out soft bags and targets, which are specifically designed to prevent injuries by absorbing the delivered force. The upside is that these bags are very good about limiting repetitive damage and impact damage to the student (and prevents arthritis later in life). The downside is that hitting these bags in no way simulates the effect of hitting a real target … like a person. An 80 kg man does not resemble a water-filled punching bag, and if all you have learned is how to how hit soft surfaces you will be visiting your local emergency room the next time you get in a real situation and have to punch someone. Does that mean I am a fan of the older ways of punching hard surfaces? Yes and no. Yes, because unless you do some work on harder and heavier bags, you will never learn to punch correctly. Your whole body has to learn how to punch correctly in order to deal with this kind of force. Should you do it continuously and only work on a heavy bag? Absolutely not. There is no reason to cause that much damage to yourself. I simply believe that it must be a part of the training routine. How much a part is up to you? Note: I suggest that adults (including women) use at least a 75kg bag if they want realistic street punching conditions. Yes, the bag may even outweigh you … but then so will that big drunken jerk you are trying to communicate with. If the elbows moves outward during the rotation of a karate straight punch the striking surface of the fist also changes so that contact is often made with the little and/or ring finger knuckles which can be easily damaged. Problems of correct alignment can also be exacerbated by karate-ka who use boxing or other padded gloves and don’t tape their wrists. A student, for example, can free fight (point or light contact) and hit softer bags without ever knowing that his or her structural mechanics are poor. And if the student is punching incorrectly, such as allowing his or her elbows to flare outward during a straight (twist) punch, it is much more likely that the wrist will be turned so as to hit with the little finger knuckle (and the ring finger). You want the force of the punch to go into your opponent, but by Newton’s laws we know that for every reaction there is an equal and opposite reaction. Thus OUR bodies will absorb as much force as we deliver. Therefore you MUST design a way to disperse the force generated so it doesn’t injure your hand (boxer’s fracture), wrist, elbow or other body part. To do this, the force should be dispersed in a distributed fashion within the puncher’s entire body. The easiest way to do this is to align the hand, wrist and arm properly so that the force is transmitted up the entire arm and into the body as a whole. If this seems simplistic, I can assure you that it is not. And unfortunately, too many schools of boxing and martial arts do not spend enough time teaching students to punch correctly. Instead they spend their training time on where to hit and how to hit fast and in combinations. They also don’t practice hitting hard against targets that simulate the human body. So how does one punch correctly? There are a number of factors. The striking surface: The point of impact should be as if it was coming from either the second or third web spaces [between the index or first finger and the long finger knuckles OR between the long finger knuckle and the ring finger knuckle]. In truth, you will strike your knuckle fist and not the web spaces between the knuckles, but if you focus on either of these points then the hand is aligned properly. The difference between the two points is that the first one (between the index and long fingers) is for a straight on punch, whereas the second one (between the long and ring finger) is for a 3/4 twist punch. The wrist: It should be perfectly straight to align the bones to transmit force up to and through it. I have seen many wrist injuries that resulted from the wrist bending upon impact. This is one reason people tape their wrists. The elbow: It should be kept close to the body so that the direction of the strike is parallel to the movement of the centreline of the body. Correct alignment of the hand ensures that any force which is rebounded from an impact is transmitted up the entire arm and the body as a whole absorbs the force not just the striking portion of the hand. Additionally the elbow must be kept close to the body so that the direction of the strike is parallel to the movement of the centreline of the body. Keeping the elbow in close to the body is just as important, for otherwise the force will stop at your elbow. You may not break the elbow, but you will injure the ligaments holding the bones in place and hurt for a very long time! Remember my prior comment: the object of the punch is to deliver force to your opponent and NOT to yourself. You WANT to deliver as much force to your opponent as you can (the maximum pressure in a very short period of time). It means speed of delivery (speed of technique). In addition to teaching my students to strike quickly, I also instruct them to leave the punch extended while the body falls into the punch, thus moving the force through the target. This gives the person delivering the punch DRAMATICALLY more effective technique than someone who only impacts the surface. I have summarized rules of force into a simple formula: F= (p2-p1)/A/T. Translated into English this means — pressure (force in this case) divided by surface area divided by time. In short, you want to deliver the force of the punch in as little area as possible to get maximum impact. Basic physics tell us that if you double the speed of a technique using the same push or pressure, the force will be quadrupled rather than doubled. Therefore speed is a key ingredient. Area of impact is another key ingredient. Look at it this way: whatever force you deliver is divided by the area that it is delivered on — we divide the force (meaning the change in pressure) by the Area (A). Also you have to divide that effect by the time (“T”) it is delivered. If you deliver force slowly then it has little effect. Remember we were going back to basics here. Even more basic than the punch is learning how to defend yourself without hurting yourself as much or more than your opponent did. And contrary to public perception, effective force is not necessarily an extension of size or strength. In reality it is a combination of delivered force (which is related to efficiency) and the ability to penetrate.